I worked as a senior lecturer at Umm al-Qura University in Mecca until last January. I taught English language, linguistics and creative writing. Over 28 years I signed three contracts with the university and had no problem whatsoever, either with students or the administration. I taught graduates and undergraduates and, as a tribute to my good standing, I was often asked to teach for the women's campus – which involves use of CCTV whereby the pupils can see the teachers but the teacher cannot see them. In collaboration with a Saudi colleague I co-authored a series of three books on writing for students of engineering and Islamic architecture. In addition I wrote weekly columns for the two Jeddah-based English newspapers, the Saudi Gazette and Arab News. I appeared on Saudi TV chat shows and was often interviewed on Jeddah FM radio. For more than fours year I also worked as an online editor of Saudi Gazette. When my tenure with the university ended, I was offered the post of editorial consultant at the Muslim World League – a non-government organisation based in Mecca. Since I am a British citizen my job transfer had to be approved by the interior ministry in Riyadh and I signed a one-year (usually renewable) contract. All my papers were in order. In May, I was called unexpectedly to the Mecca passport office and detained for several hours without any apparent reason. On that day they confiscated my passport and my residence permit. When I protested that I would not be able to drive my car or go out on the street without a valid residence permit they gave me a temporary one valid only for Mecca. I was not allowed to leave the city: my confinement had already begun. On the morning of 7 June, while working at the Muslim World League office, I was asked to return to the passport office. I was detained in the main office for several hours with no explanation and then transferred to another outfit run by the interior ministry. I had no idea why I was being detained or where I was being sent. They took away my briefcase and my mobile phone and pushed me into a room that was already full with around 500 inmates. The air conditioning and the fans did not work. There was no drinking water. The toilets were dirty and three of the five toilets were without water and electricity. One can only imagine the stink. In June temperatures in Mecca run up to 50C. 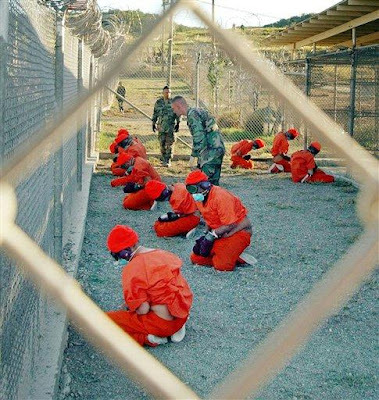 Inmates in this Saudi Gitmo were moved from one room to another every two hours or so. As there was not enough room to sit or stretch your legs it added to the stress and strain. We were made to sleep on bare floors and fights for sitting/sleeping space were not uncommon. There was a stabbing over a small sum of money – I don't know if the victim survived. The guards in Mecca were very "kind" to me. They never missed an opportunity to call me "animal", kick my ankles with their boots or step on my toes. After four days handcuffed in Mecca, I was transferred to a detention centre in Jeddah where conditions were even worse. In warehouse-like halls with no air conditioning, no fans and temperatures rising to 50C, about 1,500 people were locked up. We were provided with food but we ate only enough to survive as it was rumoured that the food was drugged to make us sleep. From the sleeping patterns of the inmates, this was probably true. After 11 days of hell I was deported to Bahrain from where I made my way back to England. I had to leave everything – my car, my flat and my belongings. I still do not know why I was singled out for this treatment which has left me jobless, broke and with a traumatic experience that is hard to overcome. As a Muslim I know that this is not Islam. How is this different from the article you posted last week here and the arrest of Chinese blogger here.